Nonfiction humor in Observations of a Transplanted Southern Belle! 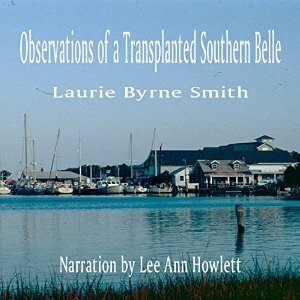 Lee Ann is happy to announce the publication of her recording of Observations of a Transplanted Southern Belle written by Laurie Byrne Smith. This is a collection of Ms. Smith’s articles for a column she wrote for a small Florida newspaper. “Short, but sweet, Observations is designed to entertain you, maybe to take you back home, or make you wish that you were a southern girl, too. It will surely make you wish that you’d grown up with a southern mother, married a southern boy and had the world’s best mother in law. Laurie Byrne Smith was fortunate enough to grow up in New Bern, North Carolina. From sweet tea to BBQ to 99% humidity, being a child in New Bern is a true southern experience. Family and home are transfused into the blood and a southern child can never quite be anything else except a gloriously tough vine of honeysuckle and morning glory with the nip of poison ivy mixed in. Ms. Smith’s Eastern North Carolina roots run all the way to Cedar Island and the Outer Banks. Of course, she must be forgiven for her northern born father and offers the explanation that he came south and stayed, as soon as he found out how wonderful it was. Transplanted to Florida in 1995, Laurie drew from those lovely southern roots and traditions to write a fun, entertaining, humor-based column for a South Florida newspaper. These short columns touch on her observations of southern living, holidays, family tradition, mothers and mothers in law, children and even passion and joy. Posted by lahowlett on July 6, 2015 in Uncategorized and tagged American south, audiobook, essays, humor, Laurie Byrne Smith.